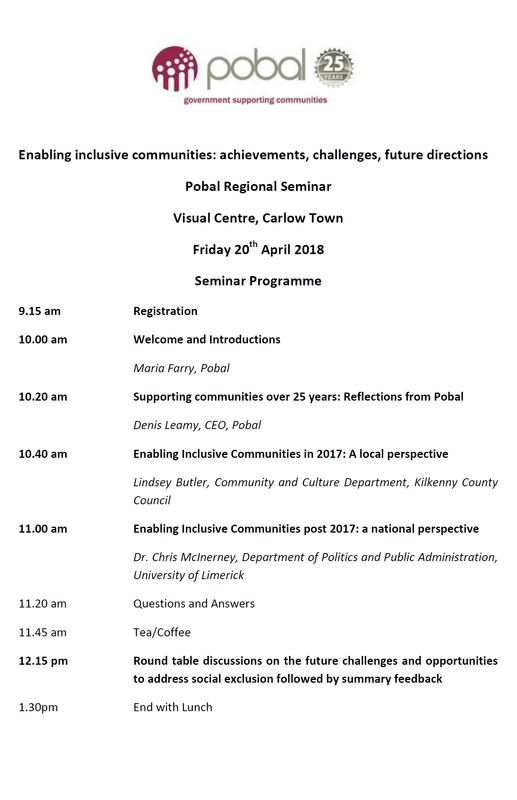 Pobal is hosting a series of 5 regional seminars across 2017-2018 on the wider theme of ‘Enabling inclusive communities: achievements, challenges, future directions’ to further explore the current context and experience of the community and voluntary sector and other stakeholders in bringing about this outcome. Inputs from local and national perspectives will be followed by an opportunity for stakeholders to reflect on achievements as well as future challenges to address social exclusion and poverty in a local and regional context. The seminar in the south eastern region of Ireland will take place in Carlow Visual Art Centre for Contemporary Art, Old Dublin Road, Carlow on Friday 20th April 2018 from 10am-1.30pm, and Pobal would like to invite you and/or representatives of your organisation to attend the event.